A collection of over 300 popular songs, including over 150new songs, for praise and worship. It captures the heritageof great songs for praise and worship as well as the newestsongs available. Included are a key index to improvecontinuitybetweensongs,ascripturereferenceindex,atopicalindexandasongindex.Perfectfortheworshipleader,musician,homegrouporindividual.Also available is the words edition. 2 - There Are 300 Songs. 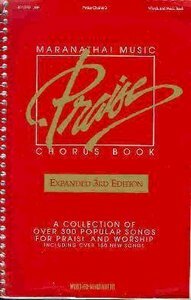 About "Praise Chorus Book 3rd Edition Music"
Praise the Lord in song, for He has done excellent things. Isaiah 12:5 (NIV) The third edition of the Praise Chorus Songbook is the newest edition of America's best selling praise and chorus book. This new edition captures the best of the heritage of great songs for praise and worship as well as the newest songs available for the worshipping church. Including over 300 songs with easy to use indexes that assist the worship planner, the 3rd edition of the Praise book is the perfect compliment to any home or office library.